I have a thing each season where I love to add one new pair to my shoe collection. Typically, a favorite wore out the last season or the trends adjusted enough that maybe that one I loved the past four years is ready for retirement. I would never tag myself as a shoe person…honestly I don’t own many pairs, but recently I have found myself eyeing them more than ever. In preparation for fall, I partnered with Nordstrom on Pinterest to share some of my favorite trends for fall including shoes. You can see the board I have been working on in collaboration with them on Pinterest. It got my wheels spinning though about all the awesome shoe trends and what shoes I would consider being my one add to my closet this season. Fall is a great time for boots, heels, and sneakers. I mean, our toes have been free long enough, right? Yeah, that is something that won’t ever be true but anything to pull out my favorite booties and sneakers as the temps cool down. So, to get us all a little excited for fall, I thought I would first share that board with you, but also gather up some of my favorite shoes for fall I think we all would love to add to our closet. I know it is still super hot and thinking about slipping on a pair of socks sounds horrible, but you will thank me in a few weeks when it’s October and the chilly days are more frequent. I love your choices! The wine colour heels are gorgeous, what a stunning shade! I could definitely see the heeled boot getting a lot of wear during the cooler months too. These are all great picks for fall! 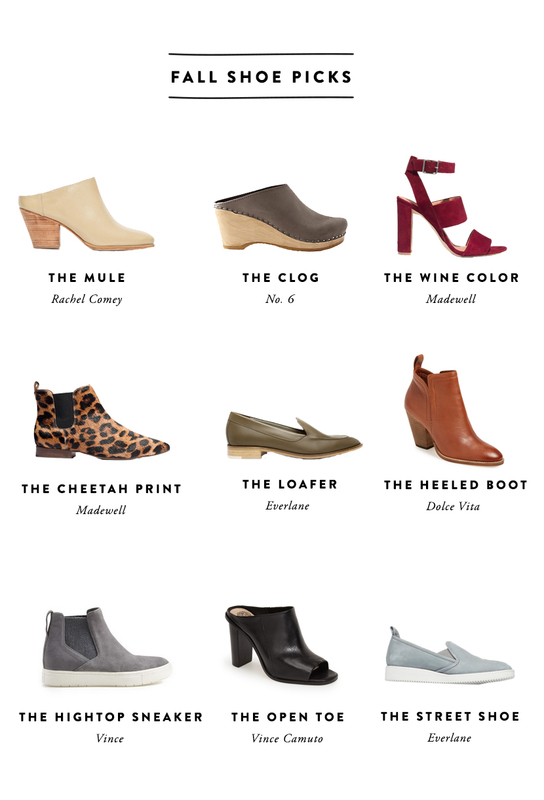 I’m loving the loafer, the mule, and the heeled boot this season. Vince sneakers are THE best! Especially those high tops you’ve got on there. The heeled bootie is my fave! Wow, i never thought I’d actually like the hightop look but i am all about this! Thanks for the post! Agree! So these ones are Madewell and I cut them to the length I wanted. They don’t make this cut anymore, but in all honesty, I think if you are short Madewell is very hard to wear. I have found that AYR makes an amazing jean! They come in lengths that fit most heights. I am 5’6 but I have short legs for my height and typically prefer a 28″ inseam on a pair of skinny jeans. I highly suggest you check out AYR. I also have found some great pairs out of pure luck on ASOS that are similar to this. I link to a few pairs in today’s post (What I Wore 04).